A change in the settings of Software & Updates opened through the menu of Synaptics Package Manager should be reflected when opening Software & Updates by issuing software-properties-gtk in the terminal. In Software & Updates opened through the menu of Synaptics Package Manager (Settings -> Repositories), I opened the Updates tab and changed 'When there are other updates:' from 'Display every two weeks' to 'Display immediately'. I then closed the window. In the terminal I started Software & Updates by executing software-properties-gtk. I went to the Updates tab and the setting for 'When there are other updates:' was still set to 'Display every two weeks'. Leaving this instance of Software & Updates open, I then opened another instance of Software & Updates through the menu of Synaptics Package Manager. Opening the Updates tab, the setting for 'When there are other updates:' was indeed 'Display immediately'. 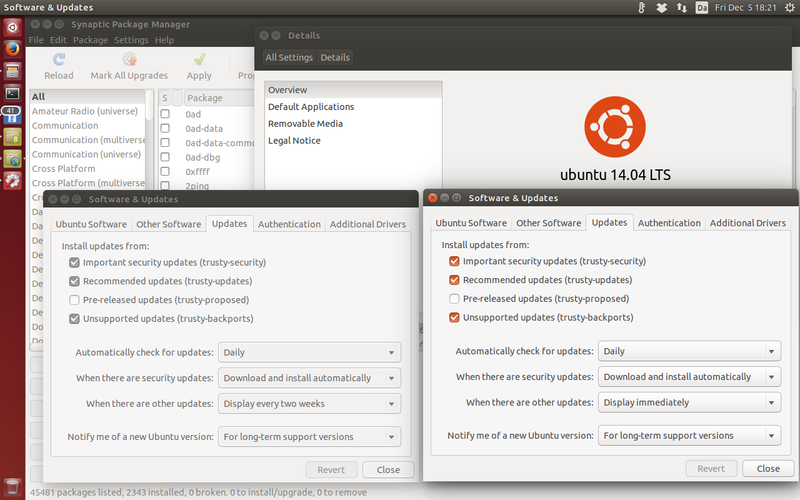 This demonstrates that Ubuntu stores two independent sets of settings for Software & Updates. However, the settings through the menu of Synaptics are ignored by the system. This can confuse a user who discovers Software & Updates through the Synaptics menu and relies on it to customize updates. I will include a screen shot of these two instances of Software & Updates open side by side reflecting their divergent settings. Both windows were opened and the Updates tab chosen. No menu items were changed before taking the screen shot.